China and Russia aren't known as leaders on food safety or animal welfare, yet there's one drug that even they-along with much of the world, including the European Union-won't allow to be fed to animals destined for the plate: ractopamine. This growth-promoting drug has left thousands of pigs lame, in intense pain, downed, and even dead. The United States isn't taking the drug off the market, and instead is dismissing the data about animal welfare problems and expanding its use. Beef producers are switching in droves to the dangerous growth promoter because they've been blocked by others within their industry from using an equally dangerous and powerful-acting drug. Fortune's Deena Shanker reported last week that beef cattle feedlot operators have been stung by the refusal of Tyson and Cargill to accept cattle at their slaughterhouses doped up with the growth promoting drug Zilmax (a drug similar to ractopamine), after reports that it caused cattle to arrive at slaughterhouses "hoofless" and in severe pain. These major meat processors made the right choice in looking at the effects of Zilmax on the animals. But, as Fortune, notes, "Zilmax's exit from the US market did not spell the end of cattle-growth drugs. It simply led to renewed interest in" ractopamine. That is, cattle producers are now substituting a drug that the Food and Drug Administration reports has already been linked to nearly a quarter million adverse events in pigs-more than any other animal drug. Its effects on human health are uncertain-the drug's safety assessment involved just one human study, of six healthy young men, one of whom dropped out after his heart began racing and pounding abnormally. But in America, ractopamine is legal, and administered to an estimated 60 to 80 percent of American pigs, with residues often finding their way into supermarket pork. The meat industry's fanatical devotion to a drug that boosts growth rates at the cost of all other concerns - animal welfare, the environment, and perhaps even human health - only makes sense when you consider the industry's mindset. For factory farmers, there's always been one frustrating limit to their ability to ramp up meat production while slashing costs: the animal's natural biology. 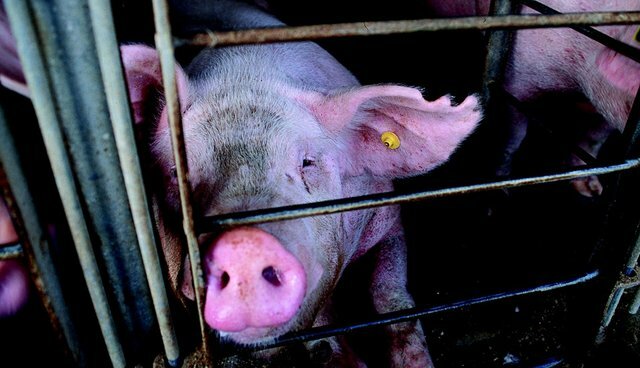 They cut corners and take dramatic steps in a neverending quest for greater yield and profits: shutting some animals indoors, jamming them into immobilizing crates and cages, and denying the vast majority of animals used in agriculture any protections under the Humane Methods of Slaughter Act. But still, animals - stubborn natural creations that they are - continue to act, well, like animals. Of course, factory farmers have found some solutions to the frustrating inefficiencies of nature. The poultry industry has bred chickens who grow over six times faster than they did 70 years ago (if we bred children that much faster, they'd weigh 500 pounds by their 10th birthday). And at the U.S. Meat Animal Research Center, The New York Times recently exposed researchers breeding cows to unnaturally deliver twins and triplets, lambs to survive with maternal deprivation, and pigs to birth litters of up to 14 piglets, causing some to be crushed alive-all in the name of the Holy Grail of "agricultural efficiency." But ractopamine allows factory farmers to achieve faster growth rates through yet one more pathway – a biochemical one. It bypasses the animal's normal biological limits by causing them to rapidly gain more weight even as they eat less feed. Never mind that it also ramps up the animal's stress hormones and heart rates, and makes pigs more likely to collapse and become "downers," no longer able to walk. Last November, we joined with other public interest groups to sue the FDA over its repeated, reflexive approval of animal drugs containing ractopamine. The FDA has repeatedly approved ractopamine drugs based on pro forma assurances from the drug's sponsors, and U.S. trade negotiators have even lobbied other nations to stop regulating ractopamine. For all the right reasons, Tyson and other major processors said "no" to Zilmax. According to Fortune, "in a March 2014 report from Texas Tech University and Kansas State University looking at a dataset of 722,704 cattle across nine feedlots, researchers found 'the incidence of death was 80 percent greater in animals administered [zilpaterol, the active ingredient in Zilmax] than the comparative control cohort.'" It's time for the whole of the meat industry – cattle, pigs, turkeys, and others – to say "no" to ractopamine, too. If their rhetoric about concern for animal welfare means anything, it should mean an end to doping animals with a drug that has no claimed animal welfare benefits – and many documented harms. Consumers should stop buying pork, beef, and turkey from factory farming interests that can't even bring themselves to pull a drug that most of the world's farmers, and the nations that represent them, have abandoned.